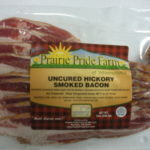 Voted the Best Bacon Ever by our customers! 240mg of sodium per 2 oz serving. 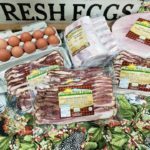 Our naturally cured BACON is hand rubbed with sea salt, celery powder, brown sugar and maple syrup then smoked to perfection the old fashioned way, in a real smokehouse with hickory and applewood! No liquid smoke is used. 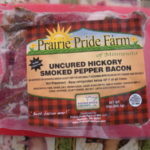 We don’t cut corners when making bacon or any prairie pride farm product. 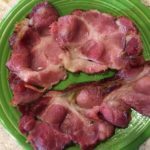 No nitrates or nitrites, except for those naturally occurring in celery powder and sea salt. Award Winning Flavor! 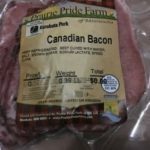 Our cottage and canadian bacon are cured with nitrite, but not nitrates.